Back from the brink: Feather-leafed banksias (Banksia brownii) introduced to a new site near Albany, WA, outside their usual ‘home’ in the Stirling Ranges. This is one of 13 threatened species, including Lambertia echinata (below), introduced to the area by the WA Department of Environment & Conservation to prevent extinctions as a result of Phytophthora dieback in their natural habitat. While pathogen susceptibility was the main trigger here, climate change may see more such managed relocations of threatened species in future. Time is fast running out for one of Australia’s most charismatic marsupials, the threatened mountain pygmy possum (Burramys parvus). This delicate animal is only found within a 3–4 sq km area of the Australian Alps where it hibernates in winter under snow. Modest though its habitat may be, the species’ range is set to shrink rapidly this century if global warming continues at its current rate. How can we help this animal adapt to a changing climate and habitat? If snow cover all but disappears, there will be no opportunity to create a protected habitat corridor – an ‘emergency exit’– for B. parvus to retreat to. Its best chance of surviving in the wild, say some scientists, is to move small populations to a new ‘home’ in forested areas below the snow-line – outside the species’ current range. The basis of this proposal is evidence from the fossil record showing B. parvus was once widespread at lower altitudes (see box below). Lambertia echinata is one of 13 threatened speceis introduced to a new site near Albany, WA, outside their usual ‘home’ in the Stirling Ranges. Moving species for conservation purposes is not new. More than 200 translocations and reintroductions of 42 vertebrate species have been carried out in Australia since European settlement. However, all relocations to date have been carried out in response to tangible threats such as introduced pests or diseases, stock grazing, land clearing or hydroelectricity works. Under current environmental regulation – particularly the federal Environmental Protection and Biodiversity Conservation (EPBC) Act 1999 – there is no provision for relocating species in response to climate change. Yet scientists point out that the unprecedented speed of anthropogenic climate change will outpace the adaptive capacity of many species. Rapid climate change has already caused changes to distribution of many plants and animals, leading in some cases to extinctions. And scientists predict entire ecosystems such as cloud forests and coral reefs could disappear by the end of the century. Late last year, the Terrestrial Biodiversity Adaptation Research Network, funded through the National Climate Change Adaptation Research Facility (NCCARF), ran a workshop at which ecologists and policy makers debated the environmental, ethical and policy aspects of managed relocation.1 Workshop participants concluded that managed relocation2 ‘is not a panacea to climate change adaptation for biodiversity and is pointless without a substantial commitment to mitigation, ongoing management of existing threats and a belief in the community that biodiversity can and should be conserved’. Macquarie University’s Professor Lesley Hughes – a Commissioner with the recently established Climate Commission, and a co-convenor of the Terrestrial Biodiversity Adaptation Research Network – agrees the approach should be seen as an ‘option of last resort’. 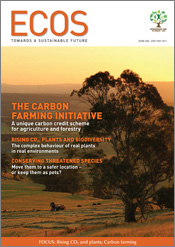 In an earlier collaboration, Prof Hughes was involved in developing a broad risk assessment framework for policy makers and conservation agencies that begins with more conventional options for conserving species.3 This emphasis on conservation in situ acknowledges the risk of managed relocation becoming a ‘distraction’ from climate change mitigation and habitat protection efforts. Climate modelling indicates the habitat of the golden bowerbird – a high-altitude species living in tropical rainforests – could shrink dramatically. Moving it to high-altitude rainforest at higher latitudes may ensure it persists in the wild. Using the framework, managers would first evaluate opportunities for reducing the level of non-climate impacts – such as pests, weeds, frequent fire or habitat degradation – on the species. ‘We simply need to do a lot better at managing existing, long-term threats,’ says Prof Hughes. The next step would be to assess the potential for species to move ‘under their own steam’ into new climate zones via habitat corridors carved out of the landscape. One of the most serious risks associated with managed relocation is the potential to create new pest problems at the target site. The more detailed knowledge scientists have about a species in situ and in the new habitat, the more robust will be the models they develop for managers. Prof Hughes’ team has already begun experimenting with moving plants to warmer areas to identify possible future responses of insect communities in the receiving habitats. Timing is critical to the success of managed relocation. Move it too soon and precious conservation resources might be wasted on a species that could have adapted to climate change in situ, says Dr Tara Martin of CSIRO’s Ecosystem Sciences. But delaying relocation until species’ numbers have dropped to dangerously low levels and genetic diversity is eroded will impede the chances of a successful move. ‘A lot of discussion around managed relocation has been about the risk of the species in a new area becoming invasive, or the risk of the species becoming extinct if you do nothing,’ says Dr Martin. ‘We are trying to provide a modelling framework for moving beyond that. If you do decide to undertake managed relocation, when would you do it? If you move a species too early without knowing enough about the impact of climate change and the potential risks of the species to the new habitat, we may end up wasting resources and the species becoming problematic. One of the strongest proponents of managed relocation is palaeontologist Professor Mike Archer of the University of NSW. His campaign to re-establish mountain pygmy possums at lower altitudes is based on fossil evidence showing the species inhabited a much wider range over its 24 million year history, ‘dwelling happily in lowland rainforests with rocky floors,’ according to Prof Archer. Rocks are a key feature of B. parvus’ alpine habitat. He says if today’s populations are occupying the extremity of a broader natural range, the species might have the physiological capacity to survive in lowland habitats, which will provide more food options as habitats change under global warming. Prof Archer believes many native Australian species, like the mountain pygmy possum, have a much great adaptive capacity than previously thought. For example, B. parvus can survive in captivity without the foods it eats in the wild. And predators, such as cats and foxes, have always been a part of the ecosystems in which they have lived says Prof Archer. With just 2000 individuals left in the wild, Prof Archer says time will be critical for relocated populations to learn to exploit new resources in lowland temperate forests. The CSIRO framework enables managers to determine when to carry out the move, weighing the biological and socioeconomic costs of relocation, species’ risk of extinction, and risk to the receiving site against predicted benefits. ‘While managed relocation will be used in some specific circumstances for species that we really value, it will not be a saviour for all biodiversity in the face of climate change,’ adds Dr Martin. A case for immediate action? Since 1970, south-west Western Australia – a globally recognised biodiversity hotspot – has become drier as average annual rainfall has dropped. This drier climate is posing a major threat to the western swamp tortoise (Pseudemydura umbrina). Two wild populations of less than 100 survive in adjacent reserves near Perth – the smallest wild populations of any Australian reptile. Two other populations have been established with translocated individuals from a captive breeding program at Perth Zoo. The western swamp tortoise: at risk of extinction due to climate change. Associate Professor Nicki Mitchell of the University of Western Australia and PhD student, Sophie Arnall, are working with the WA Department of Environment and Conservation (DECWA) and Perth Zoo to develop models for identifying viable habitat alternatives for the species – with the key element being pooled water. Unlike other tortoises, the western swamp tortoise feeds and breeds in shallow swamps in winter and aestivates (sleeps) in summer. ‘These tortoises are active when the swamps are meant to full,’ says Assoc Prof Mitchell. ‘The swamps used to hold water for 6 to 7 months in the 1960s, but 3 to 4 months is more typical. ‘This means females aren’t reproducing so often because they’re not getting as much energy to allocate to eggs. It also means the hatchlings that emerge the following year have a very short growing season. They need to be a decent size before they first aestivate, otherwise they desiccate. While Assoc Prof Mitchell believes managed relocation may be some way off for many species, she feels the situation of the western swamp tortoise – a species whose survival is directly linked to climate change – presents a clear-cut case for action. ‘These animals don’t breed quickly. They live for up to 70 years, don’t breed until they’re 10–15, and produce only 3–5 eggs. They’re not going to run amok like cane toads, and they’ve already been released in novel sites where they have had no adverse impacts. 2	Variously referred to as assisted migration, assisted colonisation and assisted translocation.